Wahama junior Brayden Davenport (11) beats out a throw for an infield single during the fourth inning of Thursday night’s TVC Hocking baseball game against Belpre at Claflin Stadium in Mason, W.Va.
MASON, W.Va. — There’s no place like home. 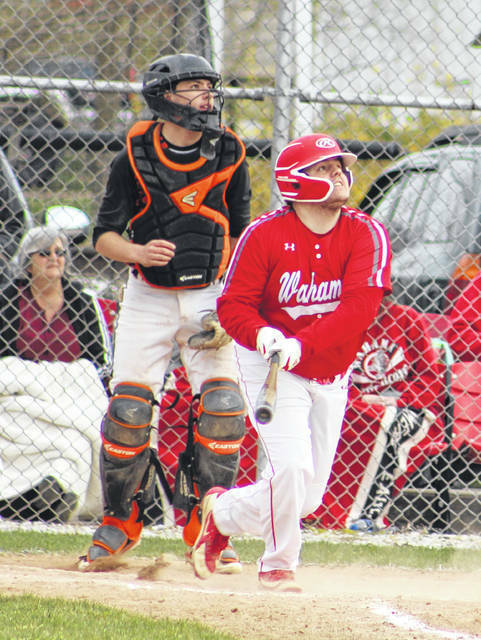 The Wahama baseball team broke a five-all tie with five unanswered runs and ultimately remained unbeaten at Claflin Stadium this spring during a 10-5 decision over visiting Belpre in a Tri-Valley Conference Hocking Division matchup on Thursday night in Mason County. The White Falcons (8-2, 5-1 TVC Hocking) found themselves in a quick 4-0 hole midway through the first inning, but the hosts countered by batting around in their half of the opening frame — which resulted in five runs on four hits, a walk and an error. The Golden Eagles, however, tied things up in the top half of the second as a Logan Adams single and consecutive errors made it a five-all contest nine outs into regulation. The Red and White secured a permanent lead in the home half of the second as Tyler Bumgarner singled home David Hendrick for a 6-5 edge. Two singles and two errors allowed WHS to extended its lead out to 9-5 in the bottom of the fourth, then a pair of errors set up Hendrick to steal home for the final run in the sixth. Wahama outhit the guests by a slim 9-8 overall margin and also committed only two of the eight errors in the game. The hosts stranded 13 runners on base, while BHS left eight on the bags. The White Falcons used four pitchers in the contest, with Antonio Serevicz getting the win after allowing one unearned run, one hit and one walk in 1.2 innings of relief while fanning three. Nick Godfrey took the loss after surrendering nine runs (five earned), , eight hits and three walks over 3.2 frames while fanning five. 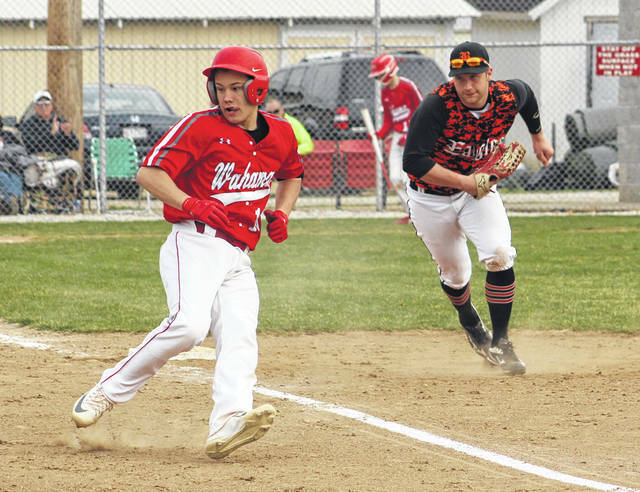 Serevicz and Tanner Smith paced Wahama with two hits apiece, followed by Hendrick, Bumgarner, Jonathan Frye, Brayden Davenport and Trevor Hunt with safety each. Serevicz led the hosts with two RBIs, while Hendrick scored a team-high three runs. Davenport and Smith also scored twice apiece in the triumph. Adams led BHS with three hits and two runs scored. Jesse Collins was next with two hits. Jeremiah Stitt had a hit and team-best two RBIs. 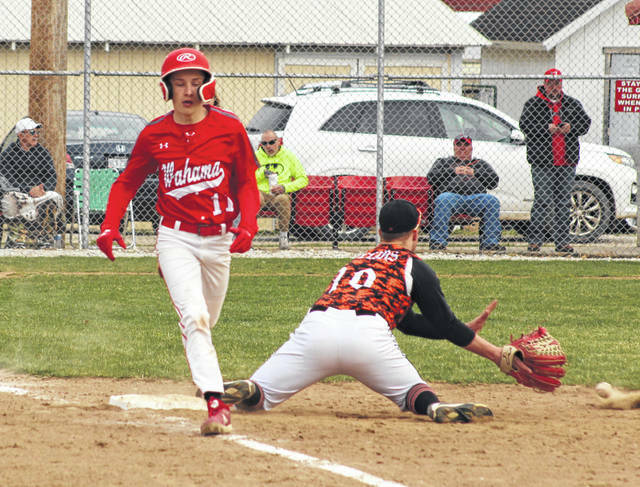 Wahama was at Trimble on Friday and returns to action Saturday when it travels to Ravenswood for a non-conference matchup at 1 p.m.